This quilt has been a long time coming. And by that, I mean the fabric was bought several years ago in hopes of being made into a nice summer quilt. In fact, my mother bought this fabric in hope of making a quilt for my little family. About a year ago, I found the fabric in her sewing room and asked her if I could take it and make a quilt. Of course she agreed, but it wasn't until I came across it a few weeks ago that I realized I needed to hurry and get it done. 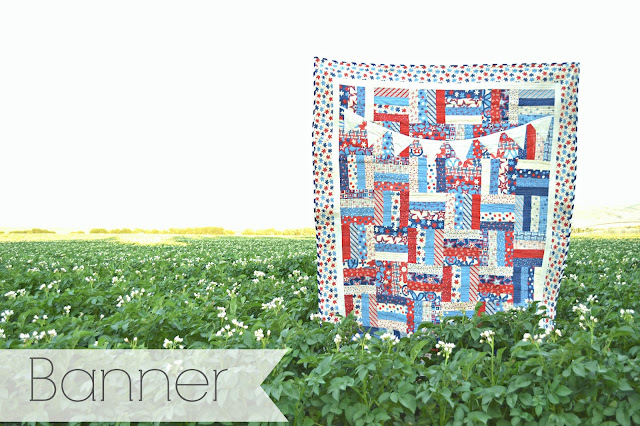 This pattern is super easy and the quilt comes together quite quickly. 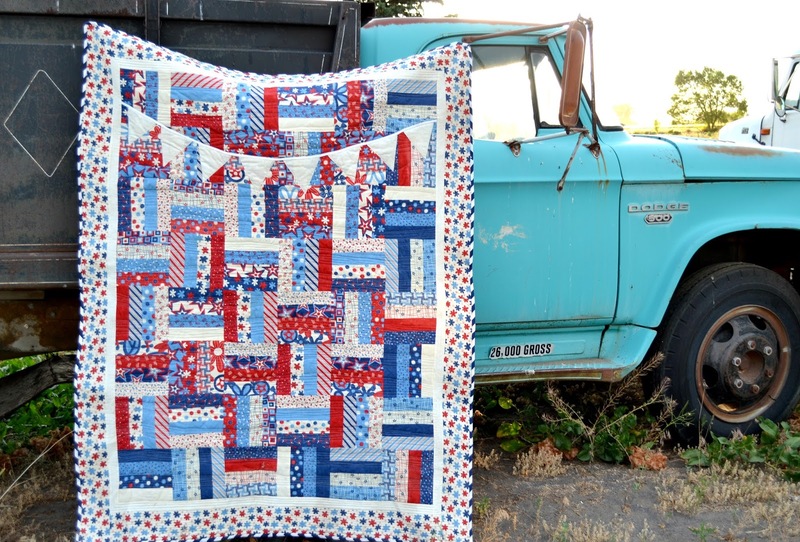 This quilt would look good in a variety of color combinations, not just patriotic. I'm thinking I want to make another one in V and Co's Simply Style line. 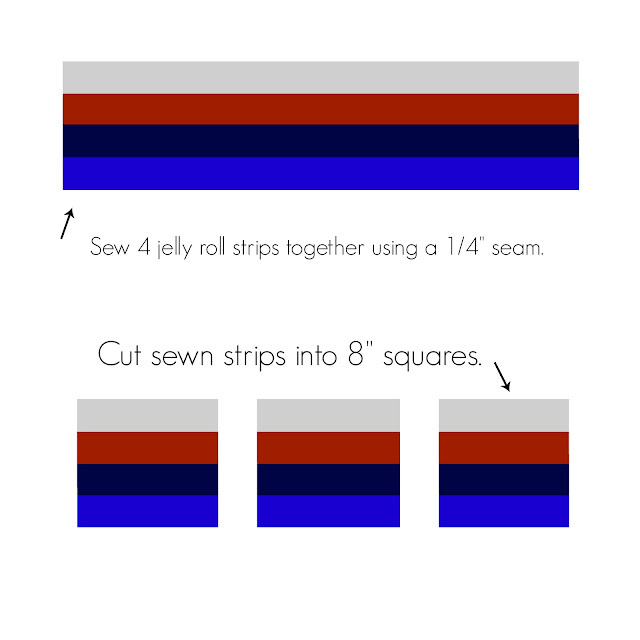 After pressing your jelly roll strips, place them together in groups of four and sew together using a 1/4' seam. Cut them into 8 inch squares. 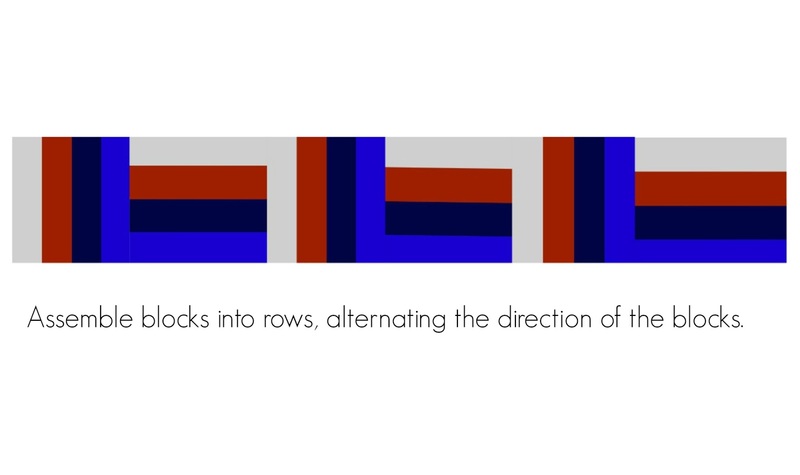 Repeat this step until you have 48, 8 inch squares. Cut 8, 5 inch squares for the banner. Fold them in half and mark a line form the bottom of the fold to the upper, outer edge. 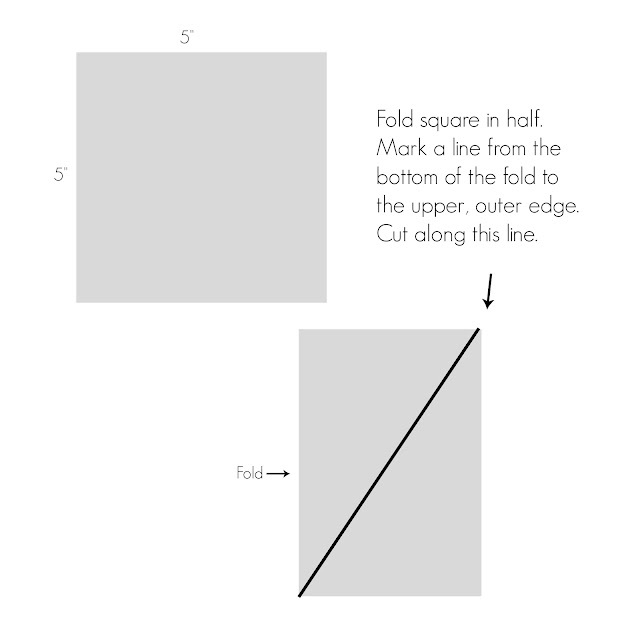 Cut along this line to make a triangle. Cut 6, 2 inch strips for inner border. Cut 6, 4 1/2 inch strips for outer border. Cut 8, 2 1/2 inch strips for binding. Now you are ready to appliqué on your banner. Take your 8 triangles and lay them out in a banner formation. Start the sides of your banner 5 1/2 inches down from the top of the quilt. 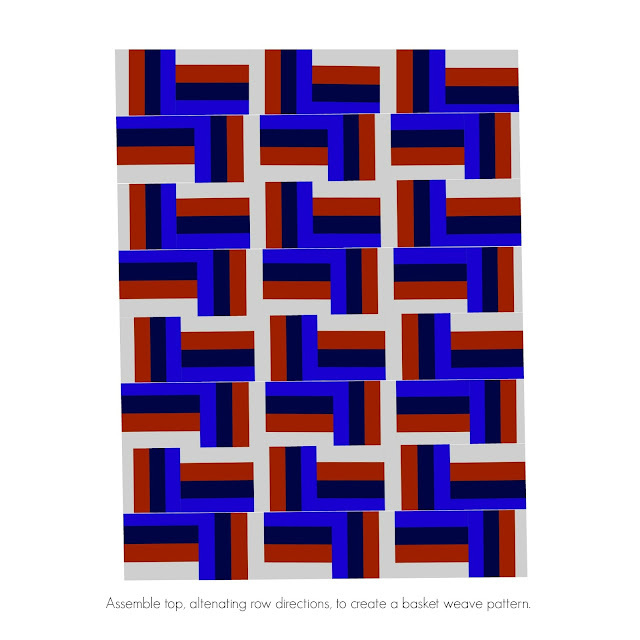 Evenly space your triangles. Adhere triangles using basting/appliqué spray or heat and bond (see package for directions). Appliqué edges of triangles with preferred method (blanket stitch, zig zag, straight stitch, etc.) I used a straight stitch because I wanted my edges to fray to give it a more rustic look. Take your bias tape and pin along the top of the triangles. Sew bias tape onto quilt. Leave extra tape hanging off each side of the banner to be sewn into the border. Sew inner border strips together in groups of two. Sew border strips onto the sides of the top, trimming where necessary. Make sure to tuck the bias tape into the seam. Repeat this step with outer border. Quilt as desired. I did straight line quilting around the borders then did wavy organic lines in the center. Bind quilt using THIS method. Enjoy! I would love to see your creations with this pattern. 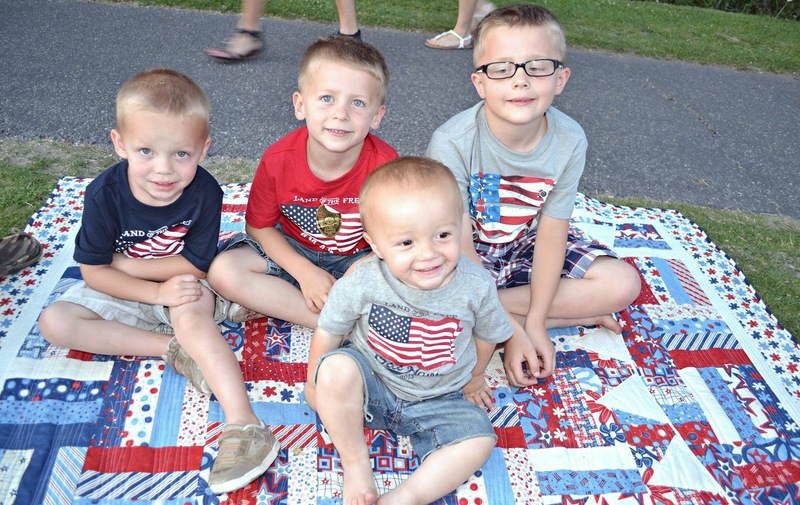 You can use the hashtag #aquahousebanner on Instagram to share your quilts. Absolutely beautiful! I love it!!!! so darling!!! Way to go!!! I love all the fabric! I am impressed. I dont think I could do this on my own.